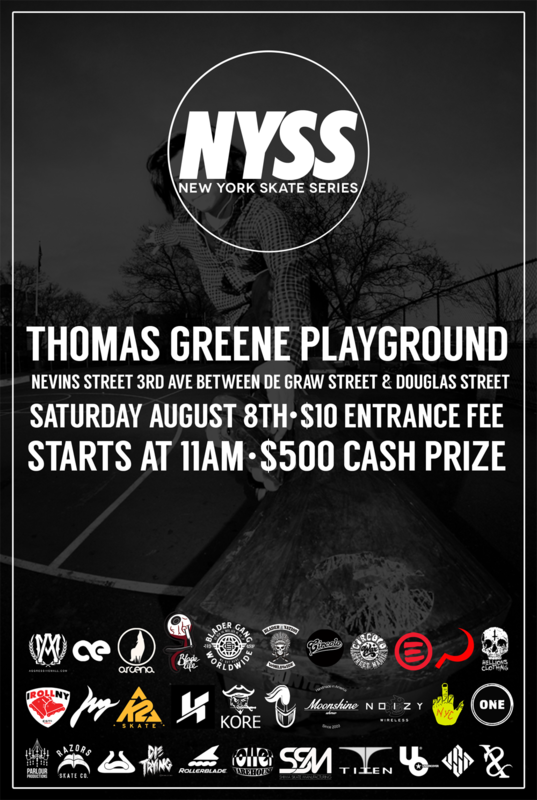 The second competition under the New York Skate Series went down August 8th, 2015 at the Thomas Greene Playground in Brooklyn, NY. We had a great turn out with a ton of great tricks from skaters coming from all over the East Coast. We brought it back to the old school with a DIY skate park to give you the raw skating that NYC is known for. With over 8 minutes of coverage we captured all of the best skating to make sure you don’t miss a thing! So sit back and enjoy the show that is the New York Skate Series! Sponsored by: Aggressive Mall, All Easy Entertainment, Arcena, Blade Life, Blader Gang, Circolo, Circolo Wax, Eulogy, Ground Control, Hellions Clothing, I Roll NY, Jug, K2, Kore, Lux Armor, Moonshine UHMW, Noizy, One, Parlour Productions, Razors, Remz, Revolution Skate Shop, Rollerblade, Roller Warehouse, SSM, Themgoods, Titen, Undercover, USD, Valo, Xsjado, and Youth Frameworks. Thank you to all the sponsors, Adonis Taylor, Jesus Medina, Cheech Martinez, Jlyn Ortiz, Ray Mendez, Eddie Chung, Sean Grossman, Craig Benabu and everyone else who helped and participated in the first ever New York Skate Series. The grand finale of the New York Skate Series is here! 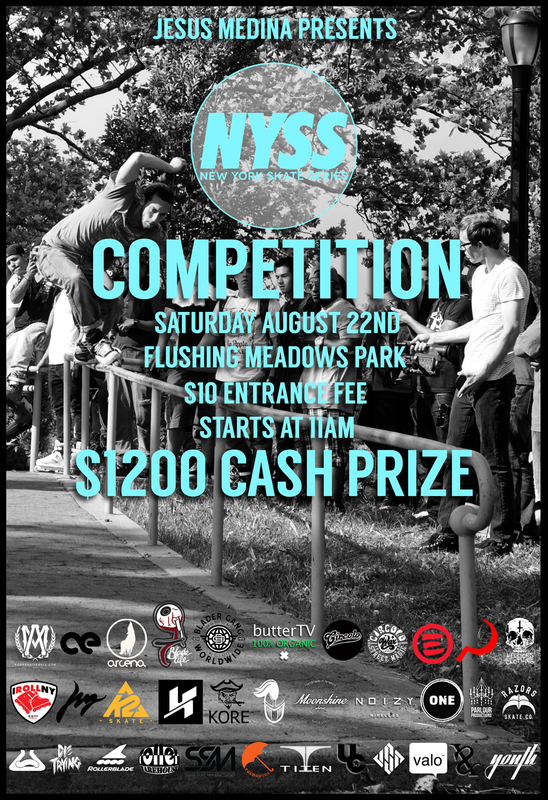 The NYSS is ending their three part competition series at the classic Flushing Meadows Park in Queens, NY. Some of NYC’s biggest tricks were done here and with $1,200 on the line we know we’ll be adding more to that trick list this upcoming Saturday. The NYSS finale is brought to you by Jesus Medina and sponsored by Aggressive Mall, All Easy Entertainment, Arcena, Blade Life Clothing, Blader Gang, Butter TV, Circolo Wheels, Circolo Wax, Eulogy Wheels, Ground Control frames, Hellions Clothing, I Roll NY, Jug, K2, Kizer, Kore, Moonshine UHMW, One Magazine, Razors, Remz, Rollerblade, Rolelrwarehouse, SSM, Them Goods, Titen, Undercover, USD, Valo, Xsjado, and Youth Co. Date: Saturday, August 22nd, 2015. Entrance Fee: $10.00 to enter. Date: Saturday, August 8th, 2015. Location: Thomas Greene Playground (Nevins Street 3rd Ave between De Graw Street and Douglas Street. Train Directions: R train to Union Street / B, D, N, Q, 2, 3, 4, and 5 trains to Atlantic Ave. The homies Chris Santiago and Augusto Castillo team up to drop this fire edit of Chris. Filmed and edited by Augusto Castillo. The New York Skate Series is a collaborative effort from local New York City rollerbladers to organize a series of competitions and events in NYC. The first competition under the NYSS was held Saturday July 25th at 12th street and Avenue D in Manhattan, New York. Sponsored by Aggressive Mall, All Easy Entertainment, Arcena, Blade Life Clothing, Blader Gang, Blader Nation, Circolo Wheels, Circolo Wax, Eulogy Wheels, Ground Control frames, Hellions Clothing, I Roll NY, Jug, K2, Kizer, Kore, Moonshine UHMW, NY Money Team, One Magazine, Razors, Remz, Rollerblade, Rolelrwarehouse, SSM, Titen, Undercover, USD, and Xsjado. Thank you to all the sponsors, Adonis Taylor, Jon Gillen, Jesus Medina, Jlyn Ortiz, Ray Mendez, Jordan Baez, Jon Ortiz, Craig Benabu and everyone else who helped and participated in the first ever New York Skate Series. Pablo Munoz’s first session on Black & Gold Circolo Paisley Wheels [59mm 89a High Rebound Round Profile] at Washington Heights Skate Park.